Historically, the key elements to any photographic image have been light and metal, and while the photographers in our LIGHT + METAL exhibition all use traditional materials, none of them are creating entirely traditional works. These artists are experimenting, pushing the materials to make original, unique physical objects that return to the medium's original magic. Most photographers who came up working in the darkroom recall the delight and fascination of developing a photograph for the first time and watching as an image slowly appeared in the tray. They were hooked. That is how I fell in love with photography – I used to spend hours in the darkroom after school contact printing images over and over, just doing things to see what the results might look like. The introduction of digital technology dramatically altered the photographic landscape and created an approachable, flexible, and prolific means of creating images in the 21st century. For the most part, I think the digital process is excellent, high-definition capture is more portable than ever, and images can be printed in the light on a heroic scale. While digital technology is complex, its practice is understandable and doesn't elicit the same sense of wonder as chemical photography. 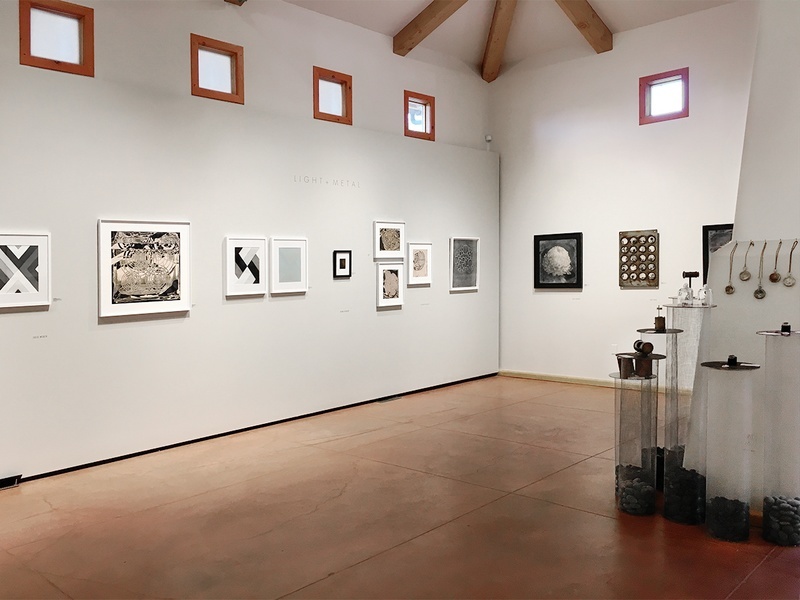 In reaction to, and in some cases liberated by, the elevation of digital photography, the artists in LIGHT + METAL are a part of a resurgent movement playfully exploring the possibilities of traditional processes like cyanotype, platinum, silver gelatin, and wet-plate collodion, among others. Here, we've constructed a process glossary for the myriad techniques seen in the exhibition in order to explain more about how the works were made. In the following weeks, we'll be delving deeper into the artists' specific contribution to the show, revealing more about their practices and intentions. 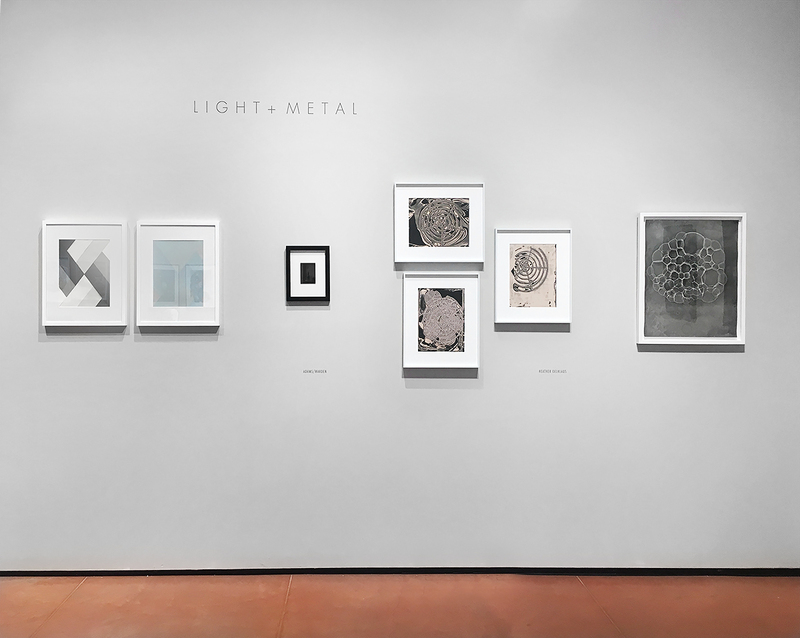 LIGHT + METAL is a passion project, and we are extraordinarily proud of the exhibition. The work is installed at photo-eye Gallery through September 15, 2018; please feel free to contact the Gallery if you have any questions regarding the artists, artworks, or techniques used in the show. Cameraless – (Anne Arden Mcdonald) A cameraless image is produced on photographic material without the aid of a camera or lenses. Chemigram – (Anne Arden McDonald, Heather Oelklaus) A Chemigram, from "chemistry" and gramma – Greek for "things written," is a photographic practice where an image is made by painting with chemicals directly on light-sensitive paper. In LIGHT + METAL, both artists pre-coat the paper in varnish to prevent chemical action, subsequently scraping away at layers of the varnish to allow areas of the paper to develop. Chemigrams were invented in the 1950s by Belgian artist Pierre Cordier. Collage – (Vanessa Woods) Collage (from the French: coller, "to glue" is a technique where a new image is created from an assemblage of different forms, such as vintage photographs. Cyanotype – (Meghann Riepenhoff) Cyanotype is a photographic printing process that produces a cyan-blue print. The process uses two chemicals: ferric ammonium citrate and potassium ferricyanide, and uses water as a developer. Encaustic Print – (Kate Breakey, Lori Vrba) Encaustic printing employs the addition of heated beeswax, and occasionally pigment, to the prepared surface of a photographic print, giving the object a unique tone and texture. Hand-colored – (Kate Breakey, David Emitt Adams & Claire A. Warden) In a hand-colored image, paint, pencils, and pigment are typically applied to a processed black-and-white photograph to add color and texture. A printing process using traditional silver gelatin paper, heat, and sunlight to expose the paper. Gold toner is used as a fixer instead of traditional sodium thiosulfate. A cameraless process pioneered by László Moholy-Nagy in 1922, the Luminogram is simply light, directed onto photo paper in the darkroom. Using their hands, a Luminographer uses gestures and intensities that yield a direct result of their actions on the paper, molding light as a sculptor might mold clay. Gottfried Jäger described it as "the result of pure light design; the rudimentary expression of an interaction of light and photosensitive material… a kind of self-representation of light." A photogram is a cameraless photographic image made by placing objects directly onto the surface of a light-sensitive material, such as photographic paper, and then exposing the material to light. A pinhole camera is a simple camera without a lens, but with a tiny aperture, a pinhole – effectively a light-proof box with a small hole in one side. Light from a scene passes through the aperture and projects an inverted image on the opposite side of the box, which is known as the camera obscura effect. These cameras can take nearly any form. 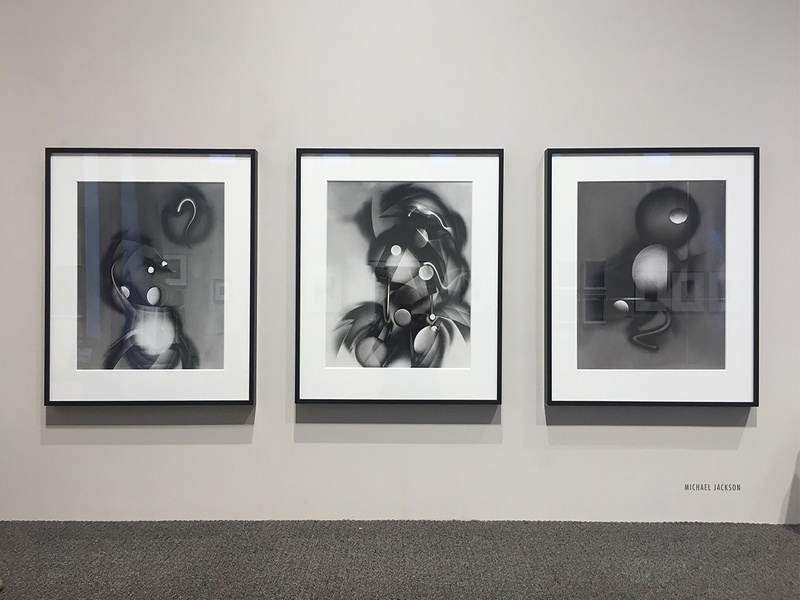 Michael Jackson's Luminograms installed at photo-eye Gallery for LIGHT + METAL. Platinum/Palladium is a black-and-white contact printing process in which the image is formed of metallic platinum or palladium in the fibers of the paper (instead of an emulsion coating on the surface). The hand-coated images are known for their luminosity, extraordinary detail, beautifully rich tonal range, permanence, and stability. Platinum and Palladium printing has enjoyed a revival in recent years as well. The collodion process, mostly synonymous with the "wet-plate collodion," requires the photographic material to be coated, sensitized, exposed, and developed within the span of about fifteen minutes, necessitating a portable darkroom for use in the field. In photography, collodion is a syrupy solution of nitrocellulose, alcohol, ether, and silver nitrate, used for coating things, chiefly in surgery and in a former photographic process. The emulsion is typically applied to a prepared glass or metal plate. Over the next seven weeks, we will continue to explore the work included in LIGHT + METAL. 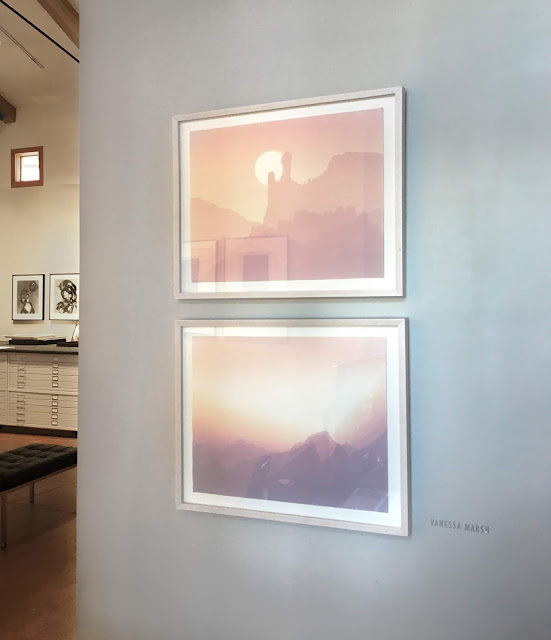 LIGHT + METAL is currently on view at photo-eye Gallery through September 15, 2018.